For those of you who are new to this community or just starting to explore, welcome. We look forward to serving you and getting to know you better. For those who have been following us for a while, you may have noticed that our 3 levels of training recently attained status as Approved Professional Development (APD) courses with the International Association of Yoga Therapists (IAYT). This matters, and I’ll tell you why. If you are a yoga student, it means that our teachers can be trusted. We offer high quality training programs that are grounded in both scientific evidence and ancient traditions. These trainings started with cutting edge research and have continued to develop and evolve over time to stay current and continue improving. The same, of course, can be said about the resources we offer to students- our DVD, book, online classes, and student manual. If you haven’t explored those, consider doing so. If you’re a certified yoga therapist, if means that you can use our trainings as continuing education as it becomes a requirement with IAYT. This is true for all 3 of our training programs, which I will explain below. If you decide to continue growing with us and become a mentor or a teacher trainer, you can trust that we will continue to expand our offerings and therefore your opportunities going forward. If you’re a yoga teacher, it means that our trainings are more likely to be accepted as transfer credits in yoga therapy programs, should you consider pursuing that in the future. It also means that more yoga therapy programs are likely to consider including our content as a training module. As you can see, the Mentored Practicum is now considered Level II, while the former Level II is now Level III. This is to make it clear that the Mentored Practicum is required between the other two trainings and is an essential component of our comprehensive training. Level III is will still result in YFA certification, but we changed the name to avoid confusion with IAYT certification. You’ll now see these changes reflected on the website and on our promotional materials. Please see here for more detail about each training, and email me directly with any questions you may have. Thank you for being a part of our evolution. I joined the Johns Hopkins Arthritis Center in fall of 2003. At that time, plans were underway for a small pilot study of yoga for people with rheumatoid arthritis. 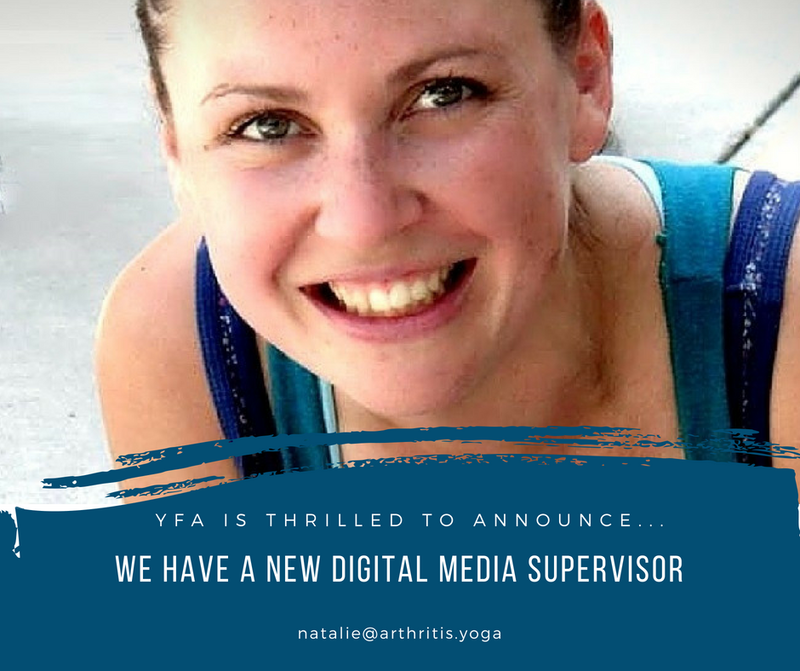 I came to help design and execute what would eventually expand to become the largest randomized controlled trial of yoga for arthritis and the topic of my doctoral dissertation. As the study expanded, we were able to bring in additional yoga instructors so that I wasn’t the only interventionist leading the 16-class series we had developed. In an effort to ensure the class was consistent, I put together a simple manual with poses and adaptations. My husband took photos of me with his point-and-click camera (this is before phones had cameras in them) in our row house living room. We later realized that the manual could be adapted for students in order to assist with home practice. 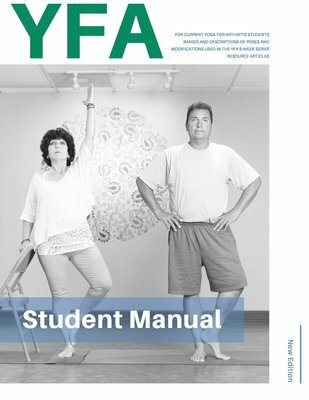 This manual has been in use for the past 15 years as Yoga for Arthritis became an organization with professional training programs around the country. With its widespread use, I realized that the research training manual needed an upgrade. I also wanted more chair variations and images of the diverse people who live with arthritis- men and women, young and old, large and small, dark and light. Ann Swanson took the lead in arranging two photos shoots. We brought it people with arthritis who were willing to serve as our models, and we worked to revise the formatting and language for each pose. We also updated the articles in the back that serve as “homework” for students in the 8-week course. 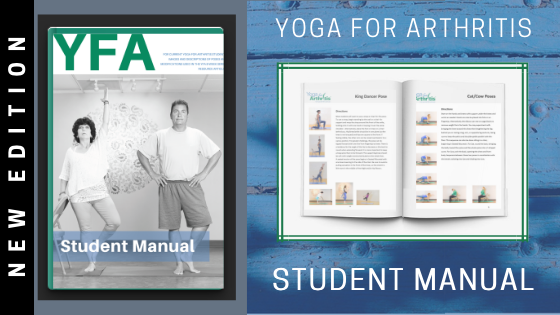 If you are a yoga professional, we hope this new manual gives you more ideas of pose variations to use with your students and clients. If you are teaching the evidence-based 8-week series, this manual is a must-have for your students. It also is a nice tool for supporting their home practice in between yoga sessions. If you are a yoga student, we hope the manual is informative and inspiring. Ask your yoga teacher/therapist which variations might be a good fit for you, and use your own internal compass to play with how they manifest in your unique body-mind. Consider reading the articles for more information about the science and practice of this work, and share it with your doctor as a way to discuss your self-care strategies. This new student manual has been a long time coming. We appreciate everyone’s patience through the years it took us to get there. It is just one of the many upgrades you’ll be seeing as we go through a phase of growth and expansion. Let us know what you think of the manual and how you are using it. And please share more ideas of how we can continue to serve you best. It has been my intention to bring yoga to diverse communities that may not feel welcome in the average group yoga class. This heart-centered mission is evident not only in my yoga teachings but in my work as a marketing and web design professional. I share inclusive language and imagery and write for our community devoid of the glossy edits that are all too common in today's yoga media. 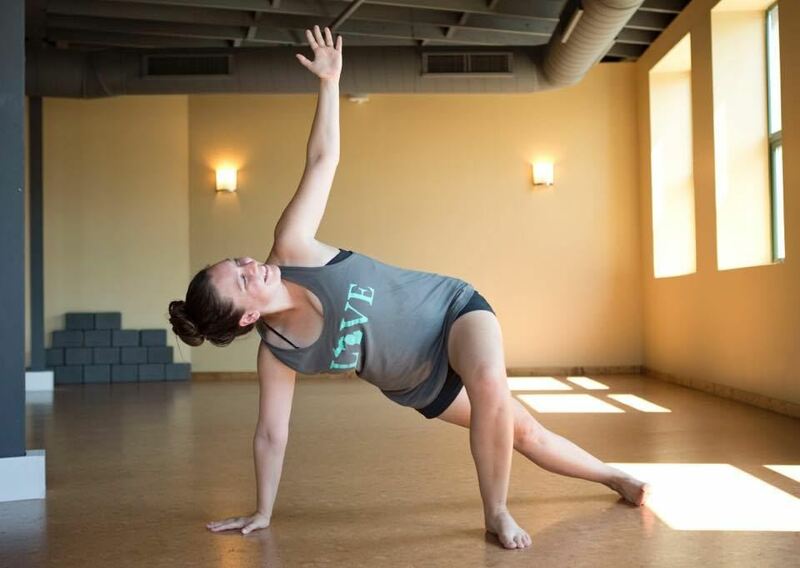 My home studio is 359° Yoga in Wyandotte, Michigan where I teach Yin Yoga and head up Community Outreach Programs. 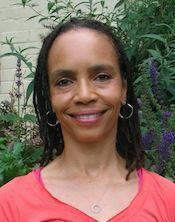 As a trauma survivor, I have become an advocate for at-risk youth by joining the Connection Coalition team of certified trauma-informed yoga teachers. My teachings reflect a path of healing through yoga by including mindfulness practices and gentleness. With a beginners heart, I always teach to my students at any given time allowing for a dynamic flow that is intuitive and ties in elements of playfulness and laughter. 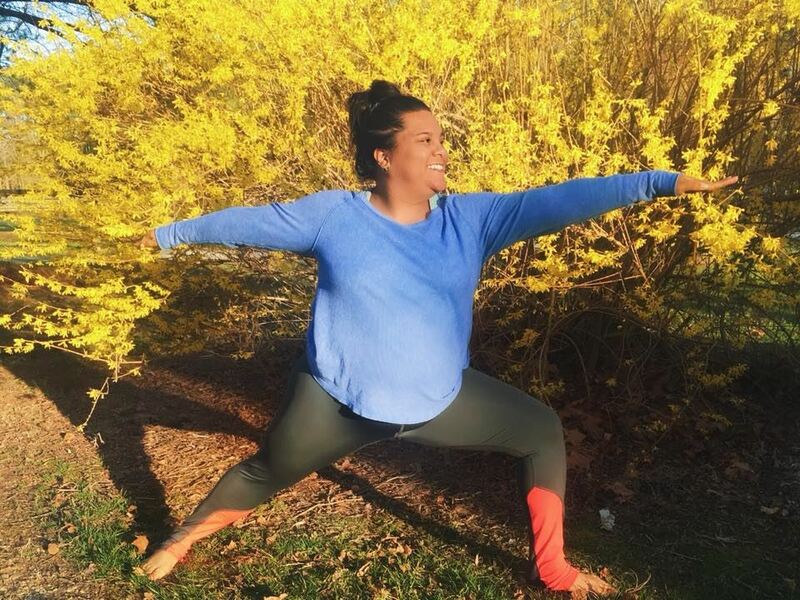 I am a mother of two and I am active in bringing yoga to community schools offering kids yoga clubs, family yoga by donation and trauma informed teen yoga at the community high school. I purposefully associate myself with yoga non profits and mission driven organizations. 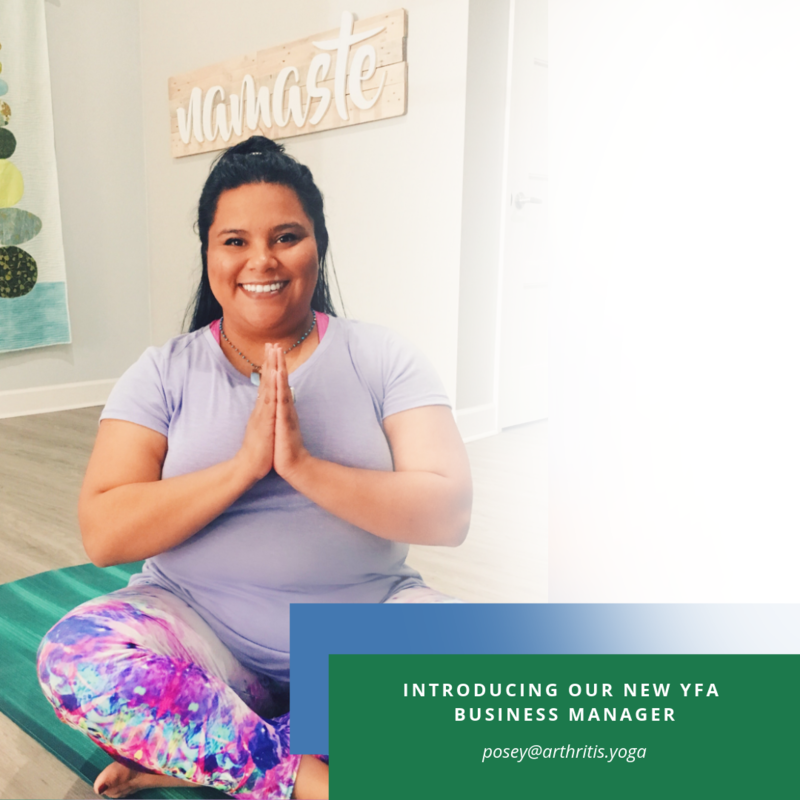 I am a proud member of the Yoga and Body Image Coalition Leadership Team and I offer web design and marketing services for the YBIC and for Puresa Humanitarian, a NPO who's mission is to rescue women and children from human trafficking in India. I also offer my services with flexible payment structures to people of all abilities with a strong focus on assisting members of the Accessible Yoga community. Joining the Yoga for Arthritis team is a natural fit as it is a beautiful and seamless extension of what I set out to do in this world, make yoga a practice that is equally available to all. You can connect with me directly at yogabusinessconnection.com or send me an email at natalie@arthritis.yoga. Yoga is not just something you do, it’s something you are: It’s a state of being, of union between mind, body and more- a connection between and beyond all of the koshas. In the west, we think of this through the paradigm of mind-body-spirit or the biopsychosocial model, which overlaps nicely with the koshas. Interestingly, the social realm is not explicitly present in the kosha model, but one could say that in a state of Bliss, we are all one and all connected. 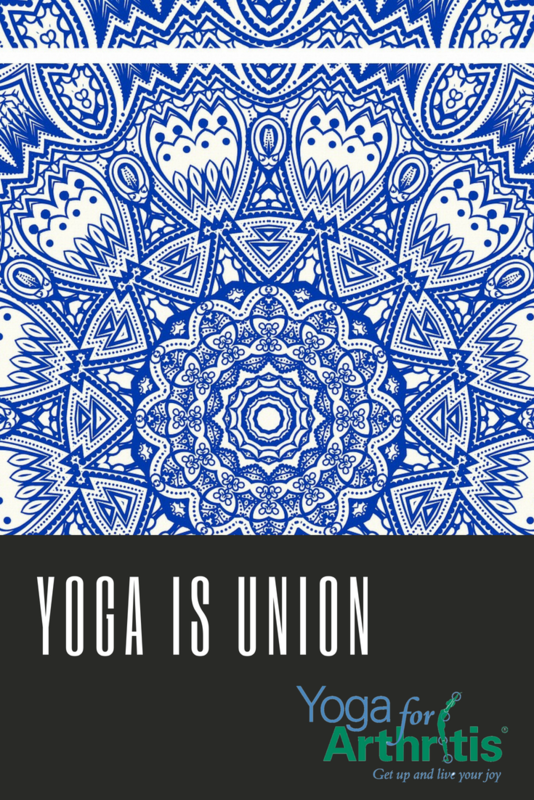 Yoga is a state of union both within and between, not just including some, but including all. Connecting with that Oneness within and between us is connecting with the Divine nature of all things. Divine nature does not discriminate and a spiritual practice of inclusion isn’t just about feeling Divine connection yourself, but assuring that the connection is felt on the other side. The greatest gift you can give to someone else is to show them that they matter- not just think it, not just say it. Practice it with your actions, with your attention, with the way you consider their experience in the choices you make. There is too much otherness, too much divisiveness and division and concern about protecting what’s mine. Inclusiveness in thought, word, and deed is a spiritual practice and a radical act of resistance in the face of forces that aim to divide us with fear. We live in an abundant world. There is more than enough food on this planet if only we would share it. There is more than enough water, shelter, kindness, love. Widen your circle of compassion. The practices of yoga- asana, pranayama, meditation- should be inclusive practices, open to anyone and welcoming to all. But being inclusive as yogis goes far beyond the mat or the cushion. Let your every encounter with friend or stranger be a practice of yolking, of union, or radically transcending imaginary, arbitrary differences and barriers. We are one. Let’s act like it. I have been offered the experience of a lifetime: co-teaching an Y4A teacher training workshop with Dr. Steffany Moonaz! This is a blessing for me in many ways: (1) Steffany has be a mentor to me for the past five years; (2) the practice of Y4A has strengthened my own physical and emotional well-being; and (3) I get to grow good karma points as I share the teacher training with others. No pun intended, Y4A has transformed not only my personal yoga practice, yet also my yoga-teacher practice. As I was reading the latest edition of The International Journal for Yoga Therapy, I came across a research paper that led me through contemplation about my Y4A yoga teacher practice. The research paper entitled, The psychology of yoga practitioners: a cluster analysis(1) , explores the “possible existence of a developmental trajectory for yoga practitioners.” The paper proposes that in the United States, there are two main styles of yoga: one that emphasizes the physical benefits of practicing yoga; and the second style that focuses on spiritual explorations of a yoga practice. The authors further defined the findings of their cluster analysis of yoga practitioners congregating into three distinct groups. Group 1 are yoga practitioners that hold high spiritual ideals, enjoy a positive body image due to their commitment to health and fitness, yet do not focus on their overall appearance. Group 2 also enjoys a positive body image due to their commitment to health and fitness, yet this is their main focus and may not concentrate on the spiritual aspects of yoga as much. Group 3 hold the lowest appreciation of their body image, are unhappy with their overall appearance and body size and are not yet focused on the spiritual aspects of yoga. The analysis concluded with the question: could yoga practitioners evolve through the groupings? My muse led me to contemplate the developmental trajectory of yoga teaching. As a newbie, my teaching style was akin to leading the class like a cheerleader. Although I knew enough to keep my eye on students so they would be safe, my goal was for students to have fun. My YTT200 class prepared me for Group 2 type-students: those physically fit and eager for a challenge, but not necessarily a “deep” practice spiritually. I did not anticipate students who had not moved in years or who have physical challenges like arthritis. Yet as my teaching practice grew, so did my confidence. This growth in confidence is predicated on my desire to understand the practice of yoga as a holistic lifestyle- body, mind and spirit. And as I grew in my teaching practice, more challenging students seemed to appear in my classes. I have learned that emotional and spiritual growth requires such challenges. Before I knew it, my classes were filled with Group 3 type-students: those with low self-esteem, unhappy with overall body image and size and in lots of physical pain! For me, the Y4A teacher training merged the two styles of yoga practices described in the research paper. I gained a deeper understanding of human physiology and the impact of pathophysiology on students– physically, mentally and emotionally. I learned how to keep students safe by encouraging them to move in mindful ways with props and other modifications. 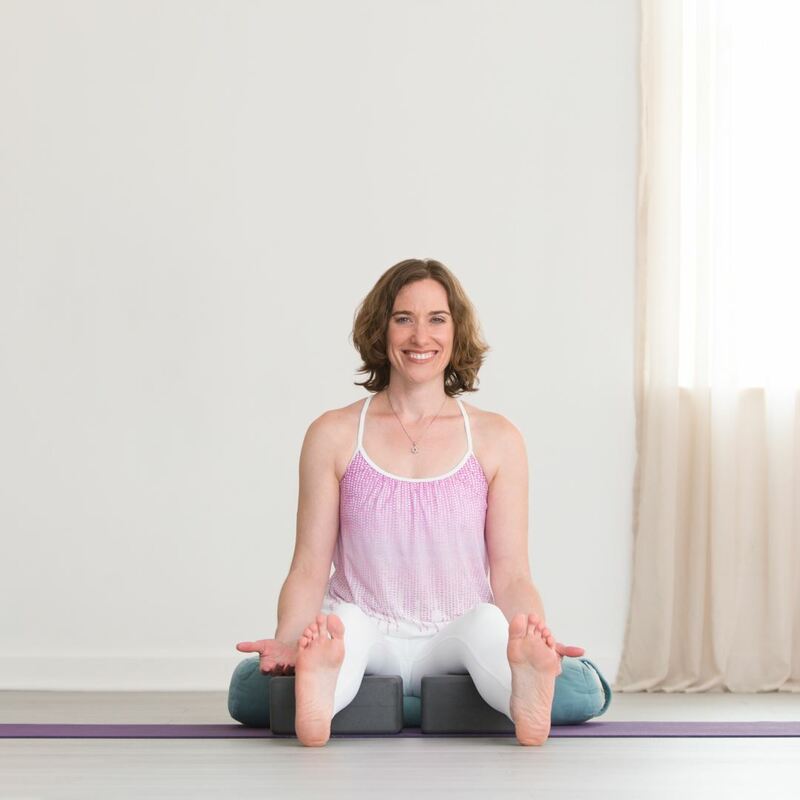 I gained an appreciation of the Yamas (Ahimsa, Sateya, Asteya, Brahmacharya and Aparigraha) and the ability to offer the practical application of them in order to encourage students to be patient with their bodies. And, most importantly, I am humbled as I observed my Group 3 type-students gain acceptance of their bodies by evolving into a deeper yoga practice. I hope you will consider joining Steffany and I at our Y4A Teacher Training Workshop in March! You can register for the March 4th 1-5PM workshop on the Yoga Center of Columbia's website HERE. (1) Genovese, Jeremy E.C., Fondran, Kristine M. The psychology of yoga practitioners: a cluster analysis. International Journal of Yoga Therapy, Vol. 27, Issue 1, pages 51-58 2017. 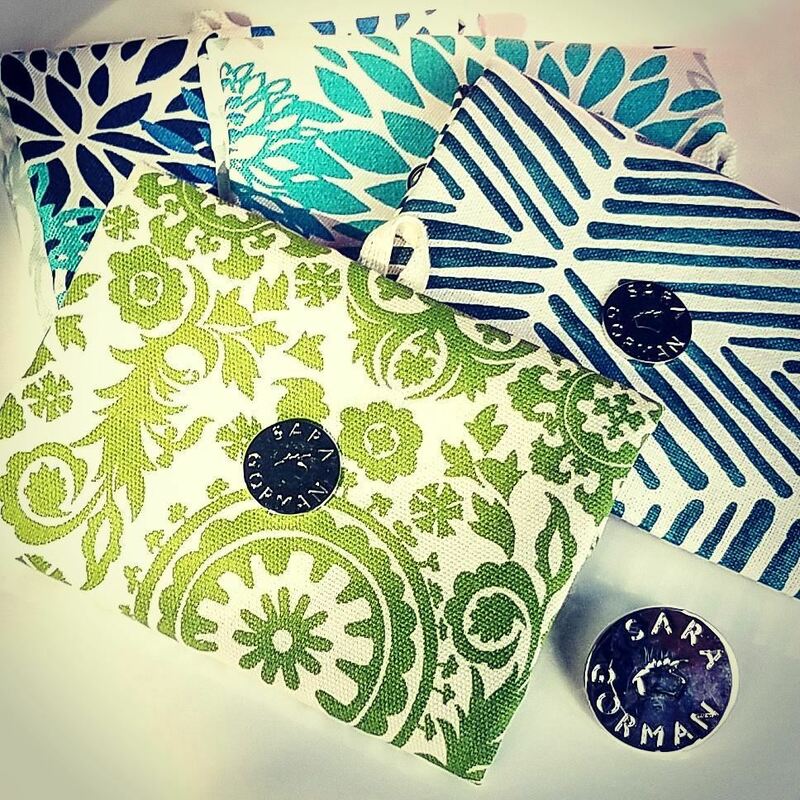 We are so excited to announce a new affiliate partnership with Sara Gorman Pillbags. Unfortunately, dealing with arthritis and autoimmune conditions requires medications, sometimes several. When you travel it can difficult to keep them all straight. Airplanes suggest you carry them with you, but for a short trip three pills in a pharmacy bottle takes up a lot of space. Dumping multiple pills into one container is a recipe for disaster. Those plastic pill containers from the drug store hold almost nothing, are hard to open even if you don't have arthritis, and will break nails. So what do you do? The search for a pill container that allowed me to organize medications and supplements in one place, that wasn't too huge, that allowed me to label it in someway so I could keep things straight and was not disposable was really hard and I despaired of ever finding anything. I now understood why people go traveling with tupperware bins of pharmacy containers. Being a lupus patient who doesn't know a lot of other lupus patients, I cruise the web looking for support and information. 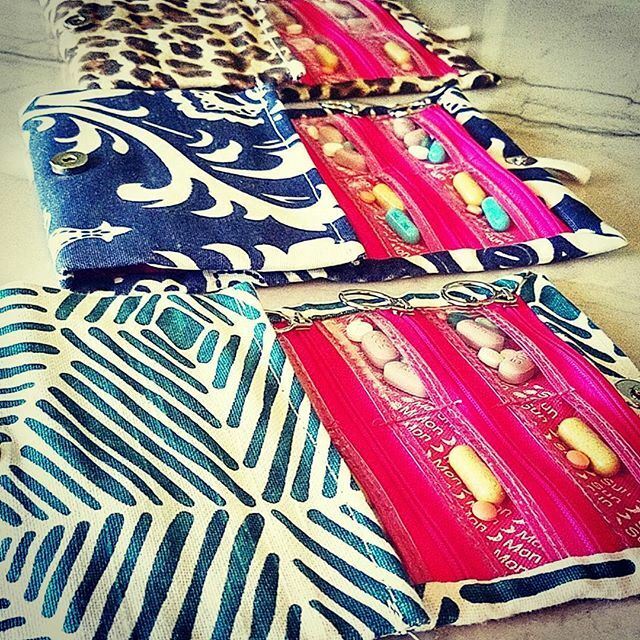 One day I stumbled upon Sara Gorman's Despite Lupus blog and she runs a business making pillfolds and pillbags. I finally found something that fit the bill! Since it's labeled, I can keep things organized by day and AM/PM. Since it's see-though, I can stick little post-its notes in it for myself so I won't mix anything up. Since it's fabric, I can wash it when it gets dirty. Not to mention it's light and has super easy open zippers that any hands can use. Happiness! I've had mine for over two years. It's held up great on multiple trips and busy work weeks and I even bought one for my sister for her birthday last year. Last but not least, a portion of the sales goes to Lupus charities to support their important work. While it might cost more up front than one of those dinky little drugstore things it represents a lot more value. Buy one for yourself or a friend at Sara's website HERE.